From the 18th July, The BBC Proms will return for another season of spectacular classical, choral, operatic, and all around marvellous music. See and hear the best composers perform in three inspiring venues, including the Royal Albert Hall, Cadogan Hall, and Royal College of Music. That's before the final night on the 13th September, when the musicians hit Hyde Park for a celebratory farewell. Tickets range from £6-£95 based on where you are sitting, but arguably the best spot in the house is the cheapest. For £5 you can go Promming. The informal standing arena is a unique feature to the BBC Proms that allows you to be directly beneath the orchestra, for an undeniably atmospheric experience. You can also choose to stand in the gallery, and let the music drift up to you. The opening night at the Royal Albert Hall will feature Edward Elgar's biblical ontario, The Kingdom. It is to be conducted by Sir Andrew Davis. The last night of the Proms, also at the Royal Albert, will host a rich mix of music, such as a new choral version of Arnold's Peterloo, with lyrics by Tim Rice, a tribute to the late Tavener with a touching performance of Song for Athene, and to celebrate the fiftieth anniversary of Disney's Mary Poppins musical, there will be a Sherman Brothers singalong. For the Proms in the Park event, Sir Terry Wogan will host from 3pm - 10.30pm, with music from the BBC Concert Orchestra, Italian tenor Vittorio Grigolo, soprano Pumeza Matshikiza, Rufus Wainwright, and legendary Earth, Wind & Fire. With all the events to choose from, it is difficult to know where to start, but there are categories to fit everyone's interest. For example, if you are new to classical music, then it is best to start with some of the most familiar composers, such as Elgar and Tchaikovsky, or Beethoven and Strauss. You might also like The BBC Sports Prom, hosted by Gabby Logan, which mixes classical music with sporting events and memorable TV themes. 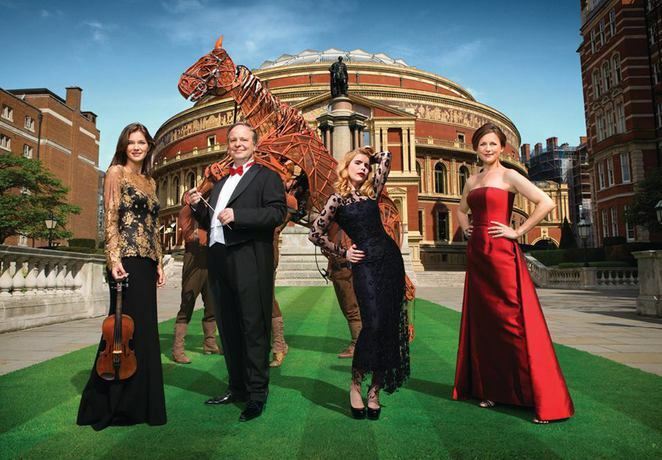 Other concerts featuring scores from stage and screen include Kiss Me, Kate and War Horse. There will also be choirs, operas, poetry readings, and Inspire Day workshops for young musicians and composers 12 - 18 years old.